This homemade costume for pets entered our 2015 Halloween Costume Contest, and won 1st place in the Best Pet Costume nomination! My dog is a great guy. Mason is mellow and will put up with anything. I knew I wanted to take advantage of that in the costume. I've always loved animals. When I was a kid there was never a Halloween when I wasn't dressed in one of my mom's hand-sewn animal costumes, so it only makes sense that I would dress up my own animal as an animal on Halloween. I also love those costumes where it looks like the wearer might have gotten eaten by the costume. I got my BFA in sculpture a few years ago so I knew I could pull off a more advanced dog costume than most. I'm a practicing artist and muralist but sometimes I like to have a little fun! I created a framework for the head out of cardboard and duct tape and bulked it out with plastic shopping bags and masking tape. I've used this method before and I love it for sculpting because it's free, green, light, and fast. And once you cover it in fabric no one can even tell how shoddy the inner layers look. I hand-sewed fabric over the head. The body is made out of upholstery fabric. I started stuffing it with polyfill and once I had used five bags and it barely even filled 1/4 of the costume I decided I wasn't made out of money and couldn't keep this up. So I mixed polyfill with packing peanuts I had laying around - which have a lot of volume, were again free and green, and are lighter than polyfil. Finally, I spray painted a couple of ping-pong balls and popped those in as eyes. The reaction was great! Everyone seemed impressed that I made it - or maybe they think I'm crazy for spending that much time and effort on a dog costume. I've taken Mason to the local dog park's contest and everyone cracked up! 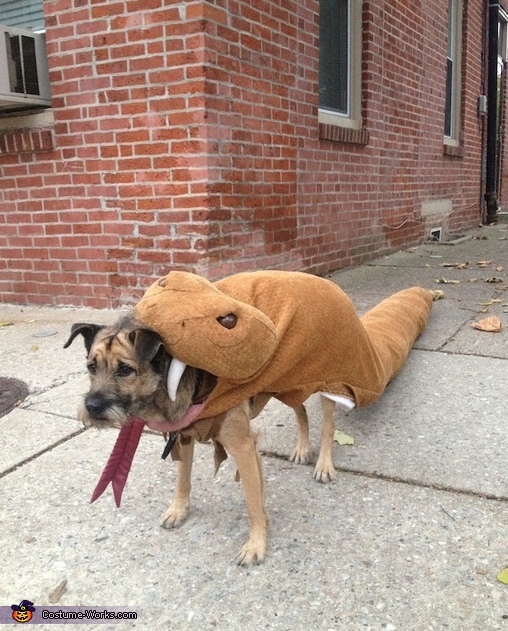 He walks around like he doesn't even have it on which makes it even more funny because he's dragging around a ten-foot long tail! I arrived late for the judging because I was finishing his costume, but when Mason showed up dressed as a rattlesnake the judge gave me a six-pack and told me I deserved to win but I was too late and this was all he had left for a prize! I wish I could upload videos - I've never laughed so hard in my life!